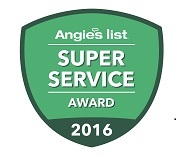 Steam Clean My Carpets, LLC has earned the service industry’s coveted Angie’s List Super Service Award reflecting an exemplary year of service provided to members of the local services marketplace and consumer review site in 2016. “We are very excited to receive this award again as it is so exciting to all of us! We provide Carpet Cleaning, Ceramic Tile & Grout Cleaning and Upholstery Cleaning. We are thankful to our clients for helping us receive this very special award again,” said Ellen Fagan, Owner of Steam Clean My Carpets, LLC.